How to Make an Outro on YouTube Chanel? How to Create YouTube End Screen? Outros, also known as “End Slates” are important when you post videos on YouTube with similar relevance as in case of Intros. Intros usually give viewers the idea who created the video. 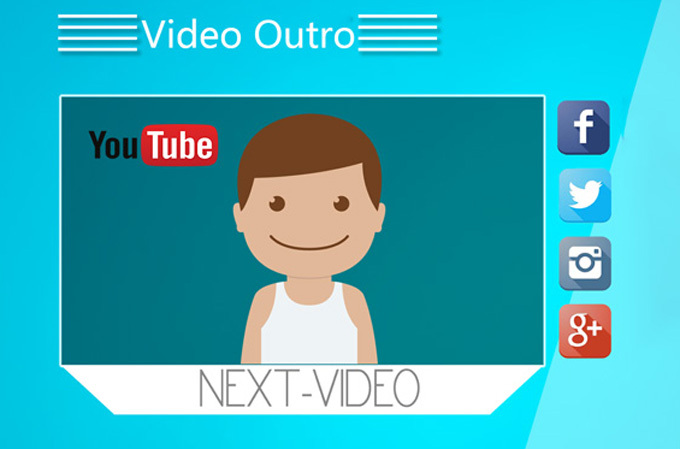 Meanwhile, outros can give additional information to them about the creator as well as the video or other relevant videos. It is not recommended that you end your video with just a simple “Thank You for Watching.” You can make an outro and put all your site details in there. You can also put in how to buy your product and services of perhaps, subscriptions to your page. This will give clients the where they can reach you in case they are interested in anything that you offer. To help you out in making your own outro, below are the best websites you can utilize. Outro editors are also suggested in the below list. How to Make Video Outros? 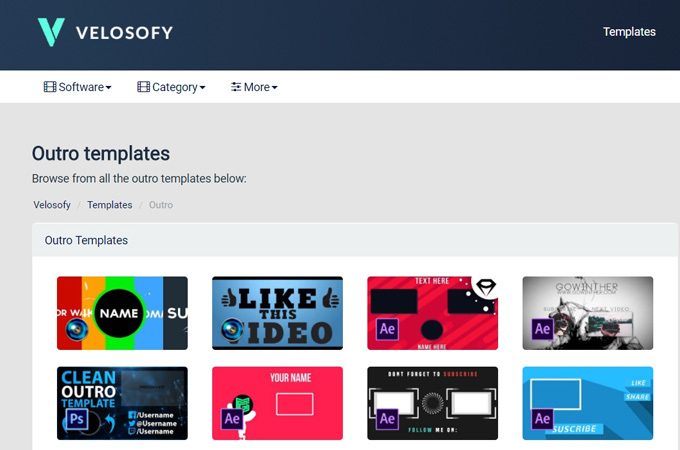 Velosofy is a site where you can download outros, intros, banners, etc. These are the selection of templates which are made from professional tools like After Effects, Cinema 4D, Sony Vegas and more. To get an outro, all you need to do is simply choose from the templates. Afterwards click the download button and wait for it to be saved on your computer. Just like the first one, Editorsdepot is a website which contains different templates for your outros and intros. To use it, just simply choose the most suitable one from the available templates and click on the “Start Download” button. 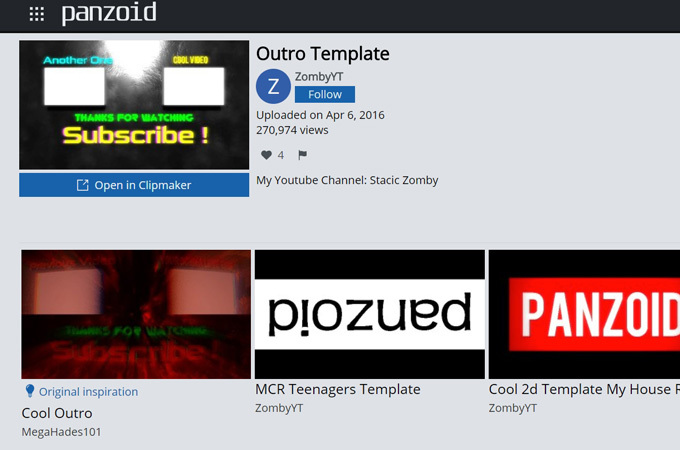 Aside from the pre-made templates, another tool which can help you on how to make an outro is the Panzoid. Actually, this works in a different way. It has a clip maker tool which can help you edit the template in accordance with your preferences. All you need to do is simply open your chosen file on the clip maker. You can then start changing texts and effects on the video according to your need immediately. Once done, go to the download tab. Render and the file will start downloading on your PC. How to Add an Outro to Your Videos? Now that you know the different websites which you can use to make your own outro, below is a list of tools which can help you add outro to your YouTube video. 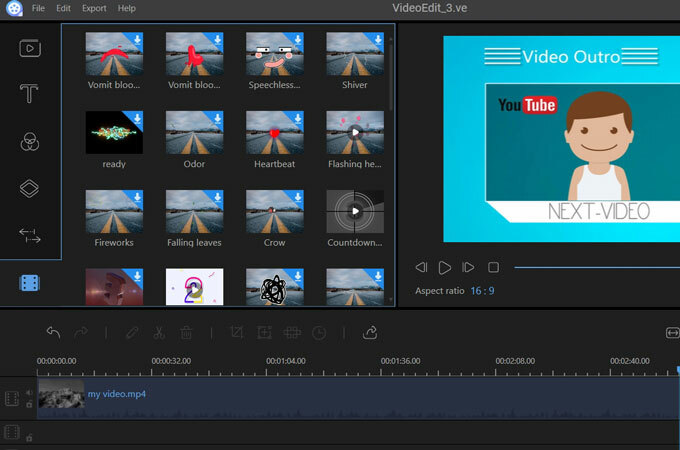 ApowerEdit is a professional video editing tool. This app allows users to edit their videos. You can also add effects, texts, overlays and transitions on the video. You may also add emojis and movie credits to the video if you want to. Furthermore, adding of outros is so easy to do in here. Here are the steps that you must follow to make an outro on YouTube. Next, click on the “import” button on the top part of the tool so that you may add the video that you want to add on an outro. In addition, choose also your outro file so that it will also be uploaded to the tool. Add effects, transitions, elements and text on it to fully enhance your video. Once done, click on “Export > Export video file” so that you can save it on your computer as one file which is readily available. Another professional tool which you can use is Lightworks. This tool can also help you add outro to your Youtube video. Furthermore, you can also add effects, text, and watermark onto your video. You can also trim, crop and split file with it. You can use it by simply downloading and installing it on your computer. Next, click on “Create New Project” and you will then be directed to the editing panel and project content panel. Just browse for the “Local Files” tab and import your main video and outro simultaneously. Meanwhile, go to “Edit” to edit your video and add some effects, text and more in it. Once done, right click on your clip and then choose “Export.” The file will then be rendered and saved on your computer. That sum up the tools and websites that you can use on how to make a YouTube outro. All of them are very helpful. Just choose which you think is more comfortable and suitable for you to use. With regards to editors, the ApowerEdit tool is the most simple and easy to use professional tool that you can utilize.